EVERY GAZILIAN KILLED IN RECENT IDF STRIKES IN GAZA BELONGED TO PRC AND ISLAMIC JIHAD TERRORIST ORGS…….. – The Tundra Tabloids……. 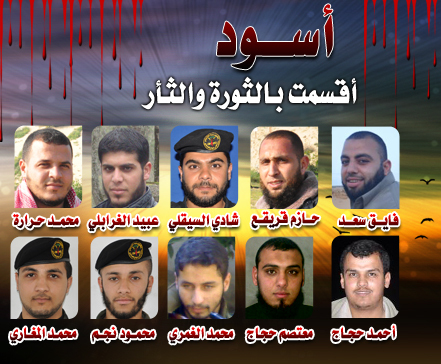 EVERY GAZILIAN KILLED IN RECENT IDF STRIKES IN GAZA BELONGED TO PRC AND ISLAMIC JIHAD TERRORIST ORGS…….. These defensive measures employed by the IDF do not happen with a bubble, there’s a reason for them. Israel has been hit by rockets on its civilian centers on a weekly basis from Gaza, when enough is enough, they strike back and take out the bastards causing the mayhem. Pure and simple. NOTE: Very dead Islamic Jihad mustards dispatched by the IDF this past 24 hrs..
6 Early Friday, terrorists in Gaza fired two rockets into Israel. A few hours later, in a preemptive strike against terrorists planning a major terrorist attack, the IDF carried out a targeted assassination, which killed the Secretary General of the Popular Resistance Committees, Zuhir al-Qaisi, as well as senior Popular Resistance Committees member, Ahmed Hanani. Go to Challah’s place for more. Next Post Next Post THE OBAMA ADMINISTRATION CONNECTED CRIMINAL MEDIA WATCHDOG MEDIA MATTERS LAUNCHES ATTACK ON ISRAEL……..